And was that ever an eye-opener. LERA meeting January 11, 2014. L-R: Jeffe Kennedy, Katie Lane, and Robin Perini. 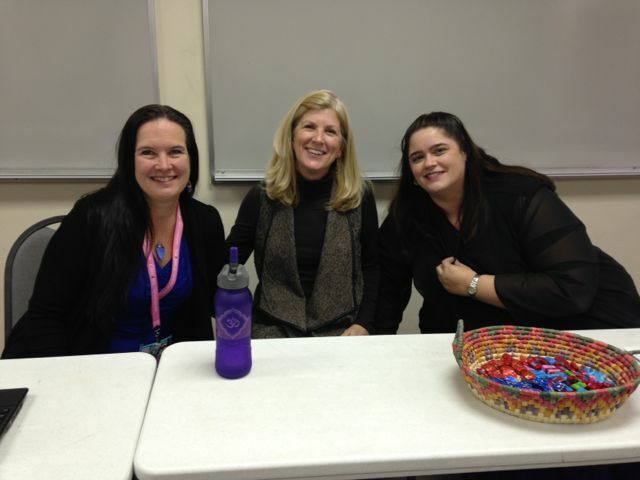 At last Saturday’s Land of Enchantment Romance Authors (LERA) meeting, four published authors shared their insight into the challenges of meeting contractual deadlines. “Keep track of how long it takes you to write and how many words,” said Katie. “And then push yourself,” added Jeffe. So I started keeping a daily timesheet in Excel to track how much time I spend on my writing. (This will come in handy come tax time, when, you know, I actually start making money at writing to be taxed on.) At the end of the daily timekeeping, I noted my word count. On the second day of tracking, I had written 732 words. I scrapped more than half of those words in revisions. By the time I was done, I had only 220 final words. It had taken me a total of almost four hours. I’m no math whiz, (obviously not, I’m a Liberal Arts major who writes in her spare time) but I’m pretty sure that four hours to produce 220 words is cause for some serious process improvement. Yeah, I need to push myself. Don’t tell my boss, though. Oh, wait. My boss doesn’t care about my word count. Sweet words! (“Jeffe is right.” ;-)) I tried to comment earlier but airplane wifi hated me. So, I would qualify that drafting are revising are pretty separate for me. While I might smooth as I go, I mainly draft and then go back and revise as a totally different effort, with a much lower wordcount. And look at you go! Good on you to start tracking now. Thanks! Just trying to get a handle on things. Aw great post!!! It’s amazing how much we learn about ourselves when we step back and take an unbiased look. Stats are hard to argue with. LOL. And I agree with Jeffe. During that first push, I can get tons of words on the page, but during the rewrites? Not so much. I’m doing really good to get 2k a day at that point. Go, Shannon!!! This is a learning process, and you are doing great just by being so willing to accept new challenges and be flexible.